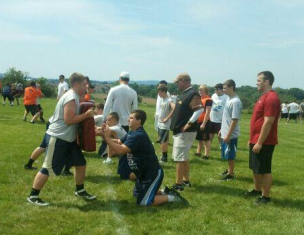 EASTON, PA (June 7, 2012) – Lauren's First and Goal Foundation welcomed a record 2,105 high school student-athletes to its ninth annual football camp held on Sunday, June 3 at Lafayette College. The previous record was set last year with more than 1,800 campers. Even more impressive was the day's fundraising total – more than $85,000 – thanks to camper registrations and donations. For the year, the foundation has raised more than $113,000 as a result of tremendous community support and generous donors. "The camp is a true community effort on every level, and so many generous people come back each year brimming with enthusiasm and positive energy," said LFG founder Marianne Loose. "We are extremely grateful to all of the volunteers, coaches, Lafayette grounds crew, football players and former team members, athletic Trainers and medical staff for devoting their time and talents to help make the camp a success." The annual event is the primary fundraiser for Lauren's First and Goal Foundation and all proceeds from the camp go directly to its mission of providing financial support for brain tumor research and cancer services, offering financial and emotional support to families living with pediatric cancer, and increasing awareness of the disease. Athletes from 16 different states and Washington, D.C. descended on the College’s Metzgar Athletics Complex to receive instruction in a variety of offensive and defensive skills from college coaches from around the country. "We are also so thankful to the high school coaches who arrange to bring their players," Loose said. "The camp not only promotes the value of community service among their team members, but also exposes them to the opportunities to continue their academic and athletic careers at the next level." More than 280 coaches representing 102 schools volunteered their time at the annual camp, as well as representatives from three NFL teams. The highlight of the day was Penn State head coach Bill O’Brien, who addressed the campers after a brief thunderstorm delay. He spoke about the importance of being people of action and the characteristics he looks for in a student-athlete, including having respect for their families and being active in the community. In addition to the Pennsylvania event, LFG will host its third annual Lauren’s First and Goal Football Camp Ohio on Sunday, June 17 at Otterbein University in Westerville, Ohio. Student-athletes can register on our camp page. Created in 2004 by John and Marianne Loose in honor of their 15-year-old daughter Lauren, a pediatric brain tumor survivor, LFG has donated more than $1 million toward the fight against pediatric brain tumors and cancer.